Russia looks set to dominate the business of exporting nuclear power plants worldwide, as its share of the market has now reached 60 percent after concluding contracts with countries like India, Turkey, Egypt and Hungary for the construction of new plants and technical cooperation. This is attributed at least in part to disasters that struck two major competitors: Westinghouse Electric Co. of the United States, once a subsidiary of Toshiba, has gone bankrupt, while Areva SA of France is fighting an uphill battle to recover from stagnancy. Having gained a near monopoly in exporting nuclear power equipment, Russia is now also expanding its diplomatic clout in the Middle East, Asia and Europe. Russia’s strength was best illustrated by its negotiations with India, which has an ambitious plan to treble the number of its nuclear reactors from the present 22 by 2024. Previously, India signed a contract with Westinghouse to build six reactors but had to look for a new partner following the U.S. firm’s collapse. This provided Russia with a golden opportunity. In May, Russian Deputy Prime Minister Dmitry Rogozin flew to New Delhi for talks with Indian Prime Minister Narendra Modi. Although details of the discussions between the two old friends have not been made public, their meeting was followed a little over three weeks later by Modi’s visit to Moscow. The two countries then agreed on the construction of two new nuclear reactors at the Kudankulam Nuclear Power Plant in the state of Tamil Nadu. Russia also pledged its full support for India’s efforts for developing nuclear plants on its own. Thus, the vacuum created by the bankruptcy of Westinghouse was filled by the Russian-Indian cooperation. This came as a blow to both the United States, which had long sought to sell its reactors to India under the administrations of Presidents George W. Bush and Barack Obama, and Japan, which had placed similar hope on Westinghouse. 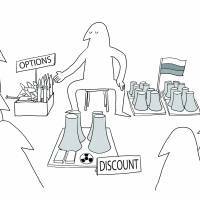 Russia currently has contracts to build 34 reactors in 13 countries, with an estimated total value of $300 billion. When nuclear fuel supplies and technical cooperation are included, Russia’s state-run Rosatom State Atomic Energy Corporation is doing business in as many as 20 countries. A European diplomatic source stationed in Tokyo laments that Areva has not won a single contract for overseas construction of a nuclear power plant since 2007. Russia is now so far ahead that Areva simply cannot catch up, he adds. In the Middle East, traditionally pro-U.S. Jordan and Turkey have been added to the list of Russia’s clients to join Iran, which has long received Russian cooperation in nuclear power development. Egypt signed a memorandum with Russia in 2015, under which Moscow will extend cooperation in the construction of Egypt’s first nuclear power station at El Dabaa. The two countries are also in talks on procurement of funds for that project. Russia now looks headed for winning nuclear power contracts with all countries in the Middle East except for the United Arab Emirates, which cooperates with South Korea. Even though Russia’s relations with the European Union remains strained following Moscow’s annexation of Crimea, President Vladimir Putin visited Hungary in February and signed a deal to build two reactors at Paks Nuclear Power Station, the only nuclear plant in that country. Determined to win a deal with an EU member, Putin went so far as to offer financing for the entire project. The EU for its part has been trying to reduce its reliance on Russia for energy supply as it imposed economic sanctions on Moscow over the Crimean annexation. However, it had no means of stopping Hungarian Prime Minister Viktor Orban from cooperating with Russia on the nuclear project. While the EU now has to face the risk of Hungary turning more pro-Russian, the Czech Republic is also contemplating working with Russia for nuclear power generation. The world has not forgotten the 1986 Chernobyl catastrophe, and doubts still linger over the safety of Russian-built reactors. Rosatom officials counter, however, by asserting that Russia has been more conscious than any other country about nuclear safety because of that disaster. Indeed, Russia no longer produces the graphite-moderated reactors that caused the disaster at Chernobyl, and all the reactors it is exporting now are of the pressurized light water type. This year, the new VVER-1200 reactor will make its debut at Russia’s Novovoronezh Nuclear Power Plant, which is viewed as a competitor to Westinghouse’s AP-1000 model. As a key factor behind Russia’s success in the nuclear power plant export business, European and American energy experts point in unison to offers of generous funding by Moscow. The Russian plants are priced 20 percent to 50 percent lower than their Western counterparts to start with, and Moscow pledges “full support” for projects undertaken by Rosatom. Recently, Russia has been securing private-sector funds on international markets to build, operate and own nuclear power stations in developing nations. This scheme benefits those countries since it becomes easier for them to procure the necessary funding, while ensuring long-term Russian influence over those nations because ownership of the plants remains with Russia. As is evident from the Russian-Indian arrangements, the countries entering into nuclear power contracts with Russia is assured of Moscow’s tacit consent in diplomatic as well as commercial dealings. Hanna Thoburn, an expert on Russia at the Hudson Institute of the U.S., says those countries receive special privileges including the purchase of weapons from Russia because Putin will be directly involved in the contracts. European and American sources say that China is likely to become the most formidable competitor of Russia, since the Chinese have accumulated rich know-how for building nuclear plants and their business has long been export-oriented. While Russia and China are likely to eventually control the global market of nuclear power plants, Europe and the U.S., which once dominated the market, are in a serious trouble, they say. However, Russia’s effective monopoly of the market is not without problems. 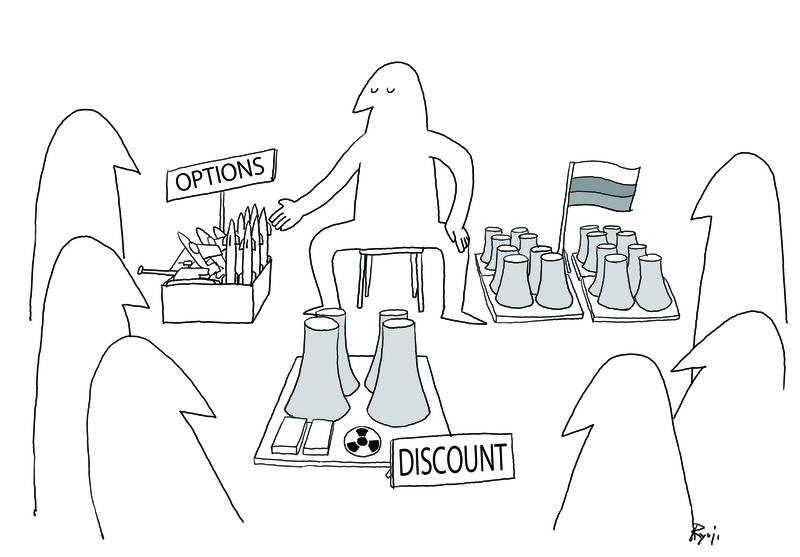 The Bellona Foundation, an environmental group headquartered in Norway, points out that many of the countries that introduce nuclear power plants for the first time lack a road map for disposal of the spent nuclear fuel. Russia has been known for being less strict on control of nuclear waste compared with Japan, the U.S. and European countries. Furthermore, countries building their first nuclear plants are faced with risks of radioactive contamination and theft of nuclear materials by terrorists and other criminal groups, Bellona points out. Moreover, should the safety standards haphazardly established by Russia spread to developing countries and become a de facto global standard, the rigorous international control of nuclear materials as envisioned by Japan, the U.S. and Europe will be undermined. A diplomatic source within the U.S. Congress laments that given the lack of demand for nuclear power generation in the U.S., there is no hope for American firms to stand up against the Russian competition. The Trump administration, the source says, doesn’t have the time or resources to deal with energy policies. The administration of Prime Minister Shinzo Abe has long sought to make bullet trains and nuclear power plants the mainstay of Japan’s infrastructure exports. This effort won’t amount to much unless Tokyo quickly comes up with the means to compete with Russia’s export drive. This is an abridged translation of an article from the July issue of Sentaku, a monthly magazine covering political, social and economic scenes. More English articles can be read at www.sentaku-en.com.